Similar to the last few weeks, afternoon storms are possible throughout the week. According to the National Weather Service, there is a 20-percent chance of rain and thunderstorms through Thursday. The majority of the storms are projected to roll in each afternoon, but the forecast calls for overcast skies, so storms are possible throughout the day. The storm system is expected to break by Friday and usher in sunny days for the weekend. 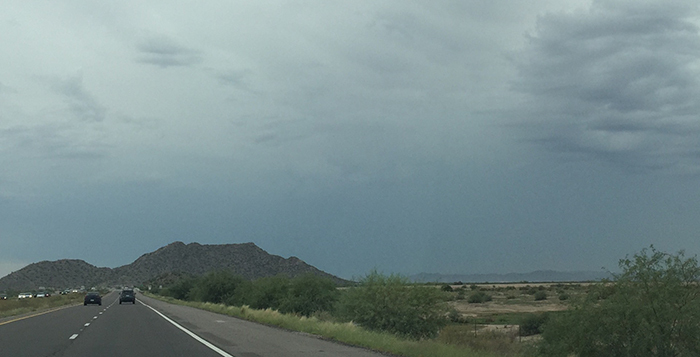 Tuesday is projected to be mostly cloudy with a high near 102 degrees. There is a 10-percent chance of rain and thunderstorms throughout the afternoon and evening. The wind is expected to stay calm near 8 mph throughout the night, and the overnight low is expected to drop to 81 degrees. Wednesday is expected to be mostly cloudy with a high of 97 degrees. The chances increase to 20 percent for rain and thunderstorms for the afternoon and evening. The wind is once again expected to be calm near 9 mph during the day and drop to 5 mph overnight. The overnight low is expected to be 79 degrees. The storm system is expected to begin moving out on Thursday. There is still a 10-percent chance of thunderstorms throughout the afternoon and evening, but the sun could begin to break through. The projected high is 99 degrees, and the wind is expected to be near 5 mph throughout the day. The overnight low is expected to drop to 79 degrees. Friday is expected to see a return of the sun and triple-digit temperatures. The forecast calls for mostly sunny skies with a high near 102 degrees. The wind should remain calm throughout the day as well. The forecast for Saturday and Sunday calls for mostly sunny skies with highs in the low 100s. More information will be available as the weekend approaches.